Condolences to my friends and family back East. Yep, my chives are blooming here in LA now… I’m hoping Spring is right around the corner for you. As always, choose blossoms that are certain to be edible, grown without pesticides, and only eat flowers in moderation. Smash cooked potatoes to break open the skins. 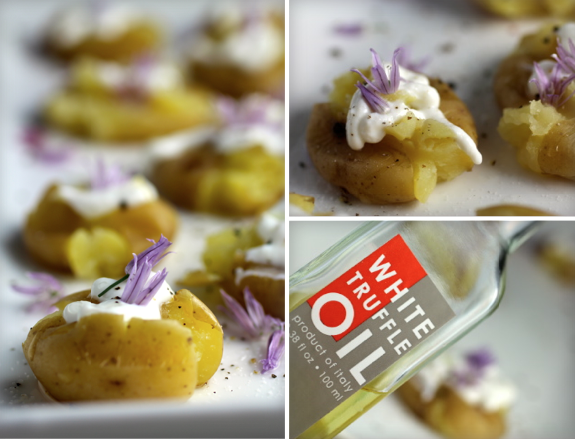 Drizzle with white truffle oil then top with a squirt of sour cream. Season with sea salt and fresh ground pepper. 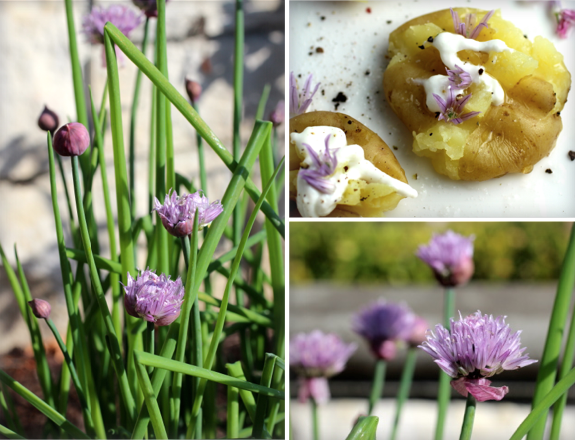 Garnish with chive blossoms. The truffle oil lends the intense perfume of white truffles – earthy, sensuous, garlicky. 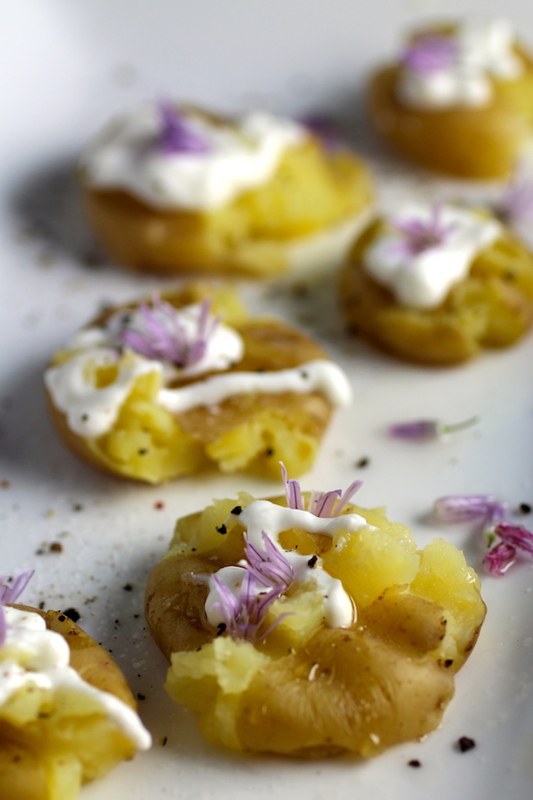 And the chive blossoms sure are pretty with that lovely lavender hue, but don’t discount the full onion flavor they add to the potatoes…these petite bites are packed with savory flavor. 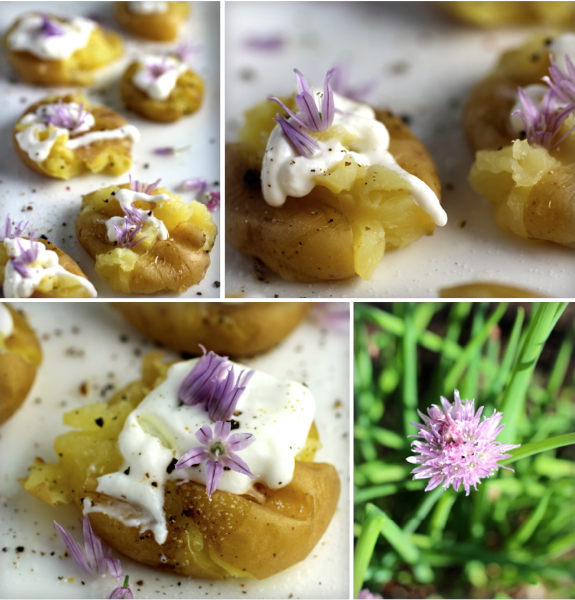 Thank you for your sympathy *sigh* These potatoes look SO gorgeous and delicious-I love truffle oil and chives–I haven’t had chive blossoms but I assume they’re scrumptious! Charming certainly is the word! And delicious, I’m sure. I usually just use the chive blossoms for garnish………I can’t wait for my chives (it’s still 35F on March 28, so I have a while to go! ).